FARM KING HAS BEEN BUILDING RELIABLE SNOWBLOWERS FOR MORE THAN THREE DECADES. THEY ARE BUILT TO WORK HARD FOR MANY WINTERS TO COME. Model 500 50" (1.3 m) cutting width. Model 600 60" (1.5 m) cutting width. Model 660 66" (1.7 m) cutting width. Model 740 74" (1.9 m) cutting width. Model 840 84" (2.1 m) cutting width. Model 960 96" (2.4 m) cutting width. Model 1080 108" (2.7 m) cutting width. Model 1200 120" (3 m) cutting width. 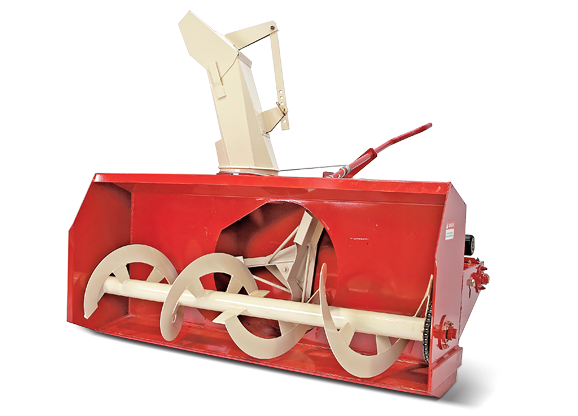 The Farm King snowblower spout rotator on models 500, 600 and 660 give the operator the option of either a Manual (Hand Crank), Electric Spout Rotator or Hydraulic Cylinder.